Hwarang, 2014. Installation shot. Photograph by Alexandra Christoff. My name is Alexandra Christoff and as part of my MA in Art Gallery and Museum Studies at the University of Manchester, I completed a placement with Manchester Art Gallery, working with the exhibition team. 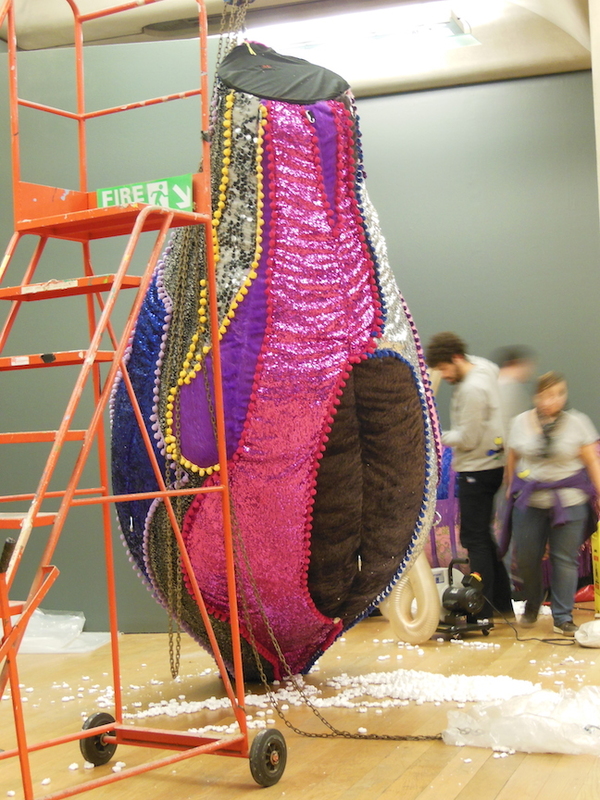 I was lucky that my placement allowed me to work on a wide variety of tasks while assisting with Time Machine, an exhibition of work by Portuguese artist Joana Vasconcelos. Over my twenty days of placement, I worked in KE EMu creating object records and adding narrative information such as interpretive materials from previous exhibitions, I researched a variety of topics for future exhibition programmes, and during the installation of Time Machine I wrote blog posts about the behind-the-scenes action. Britannia, 2014. Behind the scenes. Photograph by Alexandra Christoff. To be honest, I don’t blog. The closest I came before starting the MA was when I was required to post assignments to a class blog for one of my English courses during undergrad. I was unsure what the Art Gallery wanted me to write about, and I was nervous that I might not do a good enough job. During installation, I would arrive at the gallery in the morning, and check the schedule to see what was being installed that day and take notes about the installation process as it went along. My posts, once written up, were cleared by the curator and the artist’s studio, and generally were published to the website the day after. Oddly, the fact that my posts were vetted before publishing took most of the pressure of writing the perfect blog and once installation began, there was no shortage of things to write about. Bond Girl, 2014. Installation shot. Photograph by Alexandra Christoff. I approached the blog by writing about things that I was curious about. As a visitor it can sometimes it can feel as though an exhibition has appeared overnight. Suddenly, perfectly formed, and ready for audience consumption. But, while that effortlessness is something I think museums and galleries work towards, the gritty details are sometime the most interesting things. The installation process for Hwarang, the two marble lions in the main entrance to Manchester Art Gallery, is a good example. The process of getting the two of them and their podiums onto the plinths in the front hall was incredible. 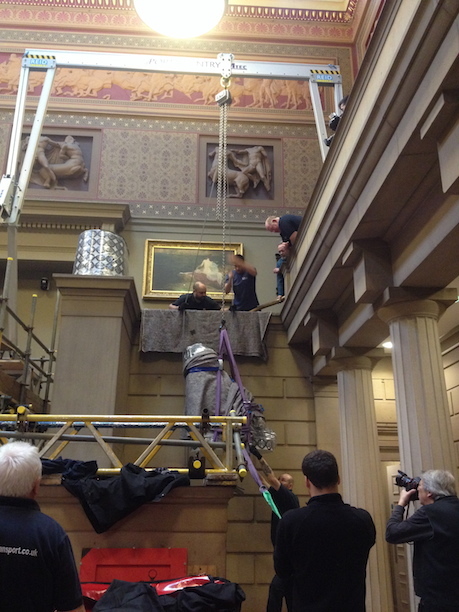 A gantry was required to lift the artwork from the floor up above the plinth, so that it could be positioned. Because of the location, before the gantry could be installed, scaffolding had to be erected on the stairs. Because the stairs required scaffolding, the floor had to be reinforced. The front entrance was closed during that time, so once the works were installed, a visitor would have no idea how much work went into just this one installation. Visitors, I think, are just as interested in the inner workings of the art gallery as they are in experiencing a flawless exhibition. That was what I saw during the installation process, specifically when installing works in the permanent galleries, while visitors were present that was made very clear. Bond Girl’s installation, had such a large audience that the technicians kept bumping into the barrier tape we’d set up because the size of the crowd competed with the space required for un-crating the artwork! Of all the things I assisted with and learned during my placement, volunteering during the installation will always be my favourite. The scale of the exhibition and the works installed were well beyond the scope of my previous knowledge working with museums and galleries and the experience was incredible.